Registrations due and a badger, too! 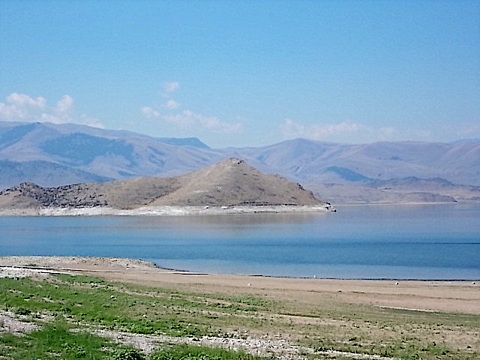 Our first few days here at Clark Canyon Reservoir have gone by quickly. I’ve puttered around the campsite and taken the crew on explorations along the lake. Today the weather is dreary, a good day to go to the Dillon post office. I need to purchase and mail a money order for $116 to the Pennington County Treasurer in care of America’s Mailbox in Box Elder, South Dakota. This is payment for the renewal of registrations on the PTV and the BLT that are set to expire at the end of the month. It’s been a year already! The postal lady says I can receive mail there via general delivery. Now I’m committed to this area until my new registrations and tag stickers arrive. 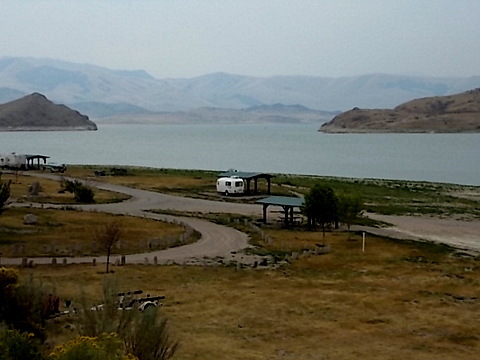 The crew and I can stay at the Clark Canyon Campground until August 21st. I hope the registrations arrive by then. Our home comes into view . . .
Back at our campsite the crew and I are surprised by an unexpected visitor. Hey, Buddy! You’re a brazen little fellow! We saw him last night and now, here he is, passing right by our shelter, rooting around in the dirt. My first thought is . . . yikes, rabies! I toss Bridget and Spike into the BLT even though they are up-to-date on their shots. 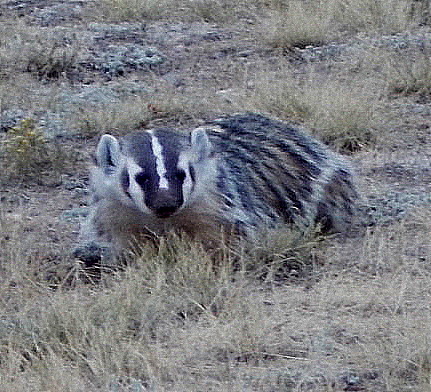 I follow the badger until I get a photo of him. He apparently isn’t rabid, just very bold. 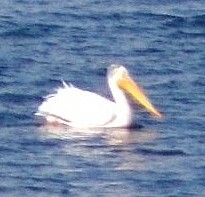 He goes on my summer’s list of “Wildlife I See for the First Time,” along with fresh water pelicans, mule deer, otters, bald eagle, moose, and grizzly bears. Oh my! The dark, overcast morning turns into a rainy afternoon. I lie on my bed reading until the sound of raindrops on the roof puts me to sleep. Bridget and Spike nap peacefully on the bed with me. When I awake, I look out the window and see that, despite the rain, campers continue to pour into the campground, towing boats for weekend fun. Hazel, the camp host, stops by. I mention the haze (to Hazel!) that blankets the mountains to the south. She says it isn’t haze; it’s smoke from a fire in Idaho. I watch the boaters and water skiers come in to the boat dock. The sun slides behind the hills on the opposite side of the lake, spreading silver sparkles across the water. This entry was posted in Simple living and tagged Americas Mailbox, badger, casita, Clark Canyon, Montana, RVing, Tow vehicle. Bookmark the permalink. 48 Responses to Registrations due and a badger, too! Love the doggy posts!! Laughed out loud!!! Dear darling dogs…………..how lucky they are to have a Mum like you Sue…………..I wish my two Coco and Chanel could read…..Ha!!!!! Glad you enjoy the canine contributions. I love the canine corner too. Very cute. Good to know. Thanks for dropping in, Sue. Yes, I’ve seen porcupines at various times in my life, most recently when camped in the Kaibab Forest of northern AZ. Spike chased a porcupine and I chased Spike. Such a sweet little face on Bridget, she is a good little girl. I love the picture of your camp from from that high vantage point. The lake looks so inviting. Wish I was there. That photo shows how dark the day has been. The BLT looks so tiny. That is an awesome view of your campsite. I don’t think you will have much problem staying in a place like that for another 10 days….fantastic. I’m thinking the same thing. If my registrations don’t get here within 10 days, I think there’s a campground way at the south end of the reservoir that isn’t checked often. Maybe I can squeeze a few more days there. Bridgett looks so innocent…her eyes are so precious. As for DMV tags they usually take about a week. I’ll be lucky if I get the tags within 10 days. Bridget uses her eyes to her own advantage. Funny how no matter what size mattress you are on…the “kids” always have to touch! Are you still sleeping on one side of the table? Sometimes I wake up and can’t figure why I feel like a human question mark..then I realize the “kids” are at the foot of the bed…or rather I’m at the head of theirs! Yes, I’m still sleeping on the skinny “twin” bed along one side. Somehow the crew and I have staked out our territory and we manage to sleep comfortably. The dog bed turned into a “day” bed, so now I put it in their pen or between the passenger seats of the PTV when we’re on the road. Really nice campground with so much space around the site, plus the lake. Bridget you just have to keep reminding Spike. Spike is a longterm project, that’s for sure. Yes, I like how the sites are spaced far apart. LOL how can Bridget look so innocent in that portrait! You must have photoshopped it! LOL! Great campsite once again! The HoundHerd sends bow wows and arf arfs to the crew! Hi, Geri! I’ve been thinking of you, hoping you’re having a great time. I love the picture of the BLT sitting in the big open spaces with lake in background. It does look like a dream come true, doesn’t it. It is so very clear that Bridget really does try to be so good. I mean just look at those eyes. I had a pair of beagles much like Spkey (Scooter) and Bridget (Scamper). 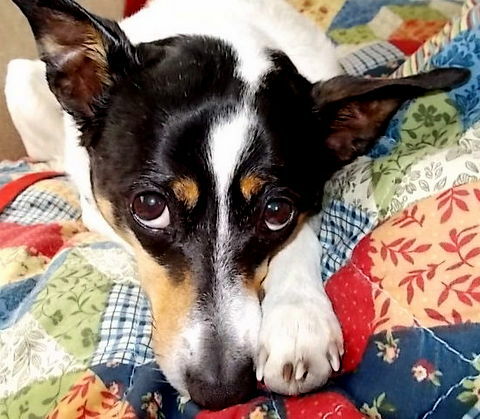 But Scamper was a serious actress…..she tried to framed poor Scooter all the time for things he actually didn’t do. Not that he didn’t do a lot on his own. Hope you’ll post a comparison shot of your campground with the warriors all around. Looks mighty peaceful in this shot. I was thinking the same thing… a comparison photo. Only I was thinking of a sunshiny day as opposed to the dreary day I took that pic. Sounds like your Scamper was a highly intelligent dog. Even if you are out numbered…STAND YOUR GROUND or you will be picked on forever. That has got to be on your top five best campgrounds!!!! Beautiful! After the great 70- 80 degree temps at North Rim, the 102 today at Page is terrible. Oh, you’re at Page! That must be a lot lower elevation than the Kaibab Plateau. Yes, this reservoir and campground both are pretty. The temperature has been good, too. There have been some hot afternoons. Usually the breeze moderates it enough. Yesterday and this morning were long-sleeves and long pants weather. He licks her ears every single day. Compulsive. Ahh cute post. You take great pictures!! Love the doggie commentary. Badgers coming close to humans? Never heard of that…they are fierce creatures!! Do be safe, you 3!! Surprising, isn’t it. He goes around checking the holes in the campground where chipmunks and a prairie dog type animal live. Suppose he was somehow “taken care of” by humans when young?? Could be the case, Elizabeth . . . or he’s gutsy. I’ve heard badgers can be that way, pound per pound, pretty ferocious little fighters. I’m guessing that the smoke is coming from the Halstead fire just north of Stanly, ID. I have been in Challis, ID for almost a month now and have had the dubious pleasure to be socked in by the smoke for a couple of weeks. It is far worse than a haze here.The prevailing wind is from the west and you are not that far east of Challis so you are getting what is left after I get my big dose. You’re right. The smoke is from Stanly. It hasn’t come up to the campground but hangs over the mountains to our south. I’ve just got back from a small trailer experience in Colorado, and was sorta catching up with you this morning. The Casita is as cute as ever in the photos, not to mention Bridget. But I’ve got a question for you. After all this time, do you have any desire for a bigger or different trailer? If money weren’t a factor, how would you change your traveling life? What shortcomings of a 17 foot trailer remain an irritant, and what have you gotten used to? I’m pretty sure from your comments you are happy with the big decisions, like taking off and having the dogs with you. But how about small ones? What would you change if it were easy to do so? IOW, how about a year end review? Are you still a happy camper? I have no desire at all for a bigger trailer. This is the sincere truth, not me unable to admit a mistake. It’s big enough to provide the space for the crew and me, yet it’s small enough to be maneuverable in tight spots. I love how I can make a U-turn with such a short radius. That proved important when I found a deadfall across the road when deep in the Kaibab Forest. There aren’t many decisions I regret, because I had lots of time to think everything through. I’m an analyzer by nature. I probably wouldn’t have bought the GPS. I haven’t used it in months. I’m still mad at it for putting us on the Coyote Road in NM, otherwise known as The Trail of the Devil. I’m happy with the options I chose for the BLT. Even though I rarely use the outside shower, I’m glad I have it. I may put up a shower enclosure around it at some point. I’m glad I bought a stabilizer bar. Forgot to put it on before driving from Bozeman to Butte and I noticed the difference. I’m thrilled with the PTV. You probably already know that! I neglected to answer your question… Would more money change my traveling life? I don’t see how. Maybe I wouldn’t be as conscious of the money I spend at the gas pumps. Maybe more money would be a detriment . . . I’d have no restraint on gas usage and would drive around too much. As it is, I go slowly, see more, enjoy much. Nothing about the BLT irritates me and I haven’t had to get used to anything. Sounds too good to be true, but it is true. Great questions, Bob. Hello, Sue. The pictures are so interesting and beautiful. We thank you for sharing. I hope you zoomed in on the badger and he wasn’t really as close as he appeared to be to you. I’ve heard that they are just plain mean if they feel at all threatened and that it doesn’t take much to make them feel that way. Loved sweet little Bridget’s blog. Funny how those two (Bridget and Spike) have such insights into the dynamics of daily life on the road. I recall you asked a couple of months ago what changes or improvements you could make to the blog to make it more interesting. I’m glad that Spikey and Bridget have decided to chime in on the Canine Corner. Enjoy your day. It’s good to hear you enjoyed the photos. Yes, I did zoom in on the badger. Most any wildlife photos I take are zoomed. Re Spike and Bridget…. It’s been a while since their input has been a natural part of my stories, and I’ve been conscious of the comments people made to include more of them. I’ll try the Canine Corner and see how it goes. I don’t want to be overly cute which is easy to do once you have animals talking! Hi Sue….Regarding the Honey Badger comment….There is a popular video on you tube which shows a honey badger in battle with a cobra….it’s become a favorite with the narrator using the term “honey badger don’t care”, among other things, as the fearless honey badger takes on the snake. Not sure, but it may have first surfaced in a commercial…. Hello, Dianne/Poppy! Nice to hear from you. I like your comment “it makes the lifestyle seem possible via the simplicity you have chosen.” In my view the simplicity makes the lifestyle fun, too! Glad to have found your blog, your sister pointed the way. Long time owner of multiple Jack Russells here and know they can be a handful. Your blog reminds me of Travels With Charlie by Stienbeck. Beautiful photos of an incredible country, keep up the good work. 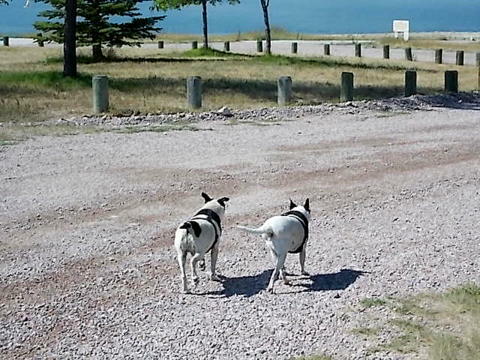 My crew are rat terriers, not quite as rambunctious as Jack Russells, but they are evil in other ways. That’s quite a compliment on my blog. Thank you! Your rvsue is the highlight of my day…you are so lucky to have her in your life!! Yes, I’m a sweetie pie every day and rvsue is very lucky to have me in her life.